ARE YOU OUR NEXT JR. HISTORIAN? About the position: This is a unique opportunity for a dynamic, self-motivated individual to be a vital part of the Albert County Museum and RB Bennett Commemorative Centre. To help manage its artifact collection, offer educational outreach and be part of a dedicated interpretive staff in telling the story of the People of the Tides and showcasing Albert County's native son, Hon. RB Bennett, 11th Prime Minister of Canada. The candidate will directly help the Manager with the day to day museum functions, and assist in the development of interpretive programming and exhibits. Strong organizational, supervisory, interpersonal and oral/written communication skills are mandatory, as well as strong social media skills, and speaking before small and large groups. Bilingualism is expected. A SUMMER JOB THAT'S FUN. CAN THAT HAPPEN? High School and University students. Looking for a summer job that's entertaining, fun and full of local history? 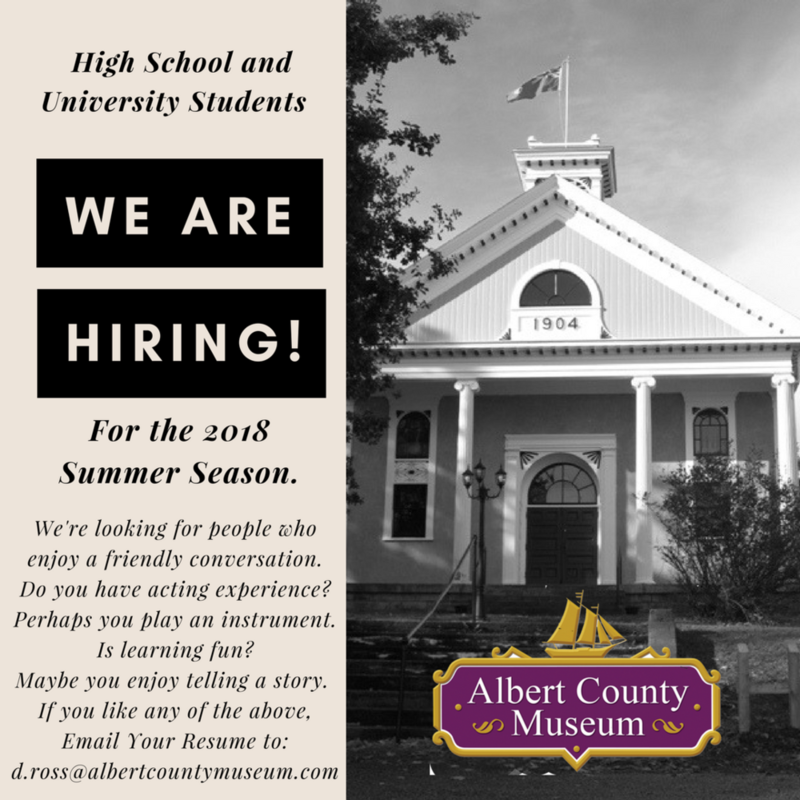 Apply at the Albert County Museum and enjoy your summer with us. We're hiring a new Manager/Curator - Spread the Word! This is a unique opportunity for a dynamic, self-motivated individual to be team leader of the Albert County Museum and RB Bennett Commemorative Centre, managing its artefact collection, offering educational outreach and leading a dedicated interpretive staff in telling the story of the People of the Tides and showcasing Albert County's native son, Hon. RB Bennett, 11th Prime Minister of Canada. The incumbent will direct the day to day museum management functions, train and supervise the summer student staff and develop interpretive programming and exhibits. Education in business management with a strong emphasis on curatorial and museum management and/or prior experience in a museum or historical property setting is preferred. Strong organizational, supervisory, interpersonal and oral/written communication skills are mandatory, as well as strong social media skills, and speaking before small and large groups. Bilingualism is an asset but not a requirement. This is a seasonal position. Salary to be negotiated commensurate with experience. Please submit cover letter, résumé and two reference letters. Applications will be accepted until Friday, January 6, 2017.